Marshall Duetta Spyder hung just off Earth and watched the moon turn liquid. Then the remnants of a distant shock wave rattled her legs. Quantum the Time Travelling Train burst through the lunar surface, spraying icy droplets into space. Duetta spoke telepathically to her cohorts. "Stand by." "There's another craft, Marshall," came a silent response. "Ice Mice," growled Duetta. She transmitted another message. "Battalion Two. Give that craft trouble." A thousand red spiders broke orbit and headed for the saucer. Marshall Duetta turned her gaze to the moon. She knew the value of water and the sinister role of the Ice Mice in diverting natural resources. Climatic catastrophe was the certain result. She sent another message, this time to the Wabbit. "All possible information. Copy." The Wabbit's radio voice vibrated through every hair she had. "The moon is full of water. The discovery droid told no-one." Marshall Duetta rattled her legs. "Someone else knew. We have company." The Wabbit's voice was harsh. "Can you divert them?" "Not indefinitely," said Duetta. The saucer was at a standstill, but suddenly powered up and made for the moon's surface. Quantum moved to intercept. For a moment a collision looked unavoidable, but Quantum vanished and reappeared from the far side of the moon. 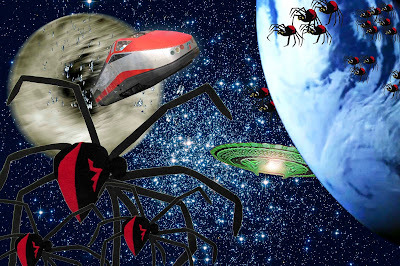 Trapped between Quantum and the spiders, the saucer shuddered to a halt. Red spiders covered the craft. Duetta hissed and bared her fangs. "Smother it."